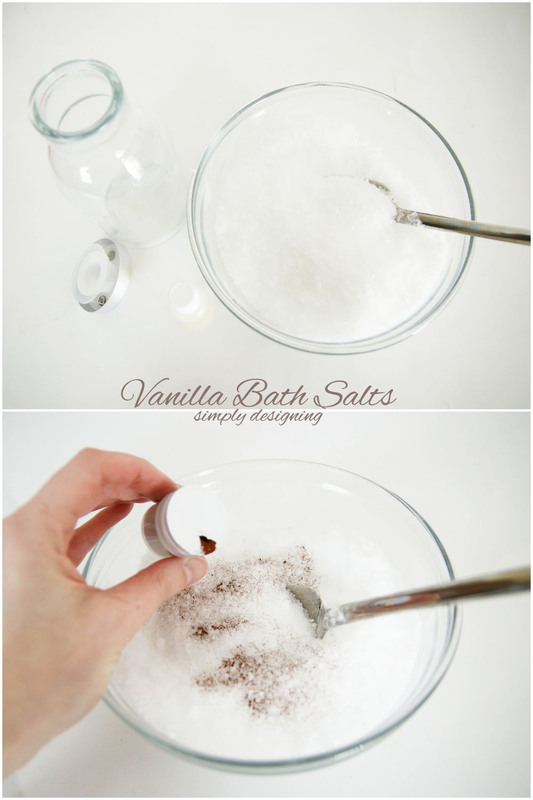 Bath Salt Recipe Scented with Vanilla - Make it in Minutes! 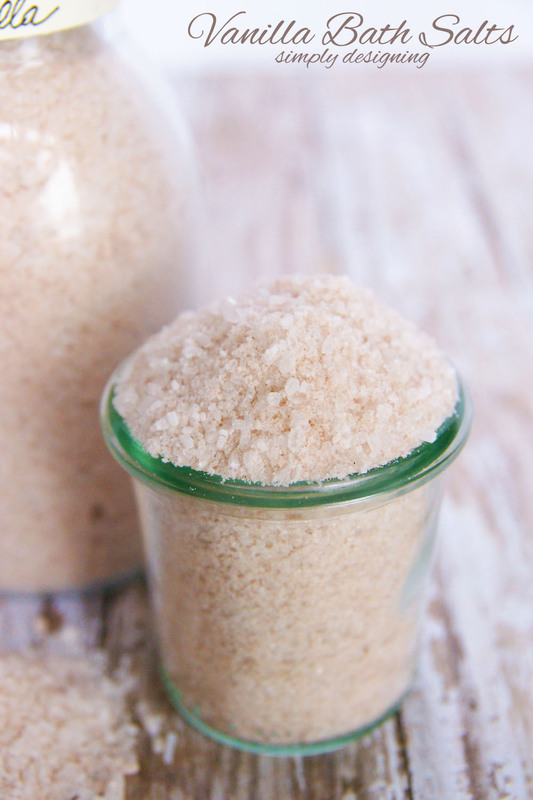 This yummy smelling vanilla bath salt recipe is so simple to make. 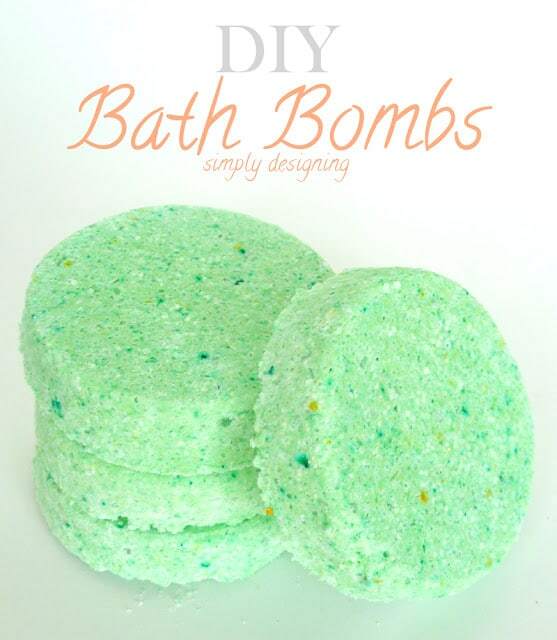 Bath Salts make a bath extra luxurious with just a few ingredients and a couple of minutes. It’s true, you can purchase bath salts at many stores, but they are so simple to create yourself and so inexpensive and so I just love making them myself! This also gives me the ability to control what I put into my recipes so I can customize them just for me. Sometimes I get so cold this time of year that nothing except a warm shower or bath can truly get me warm again! (-20 degrees and I simply do not get along!) So I made a batch of savory bath salts to help soothe my skin and my soul as I relax in a nice warm bath this winter! 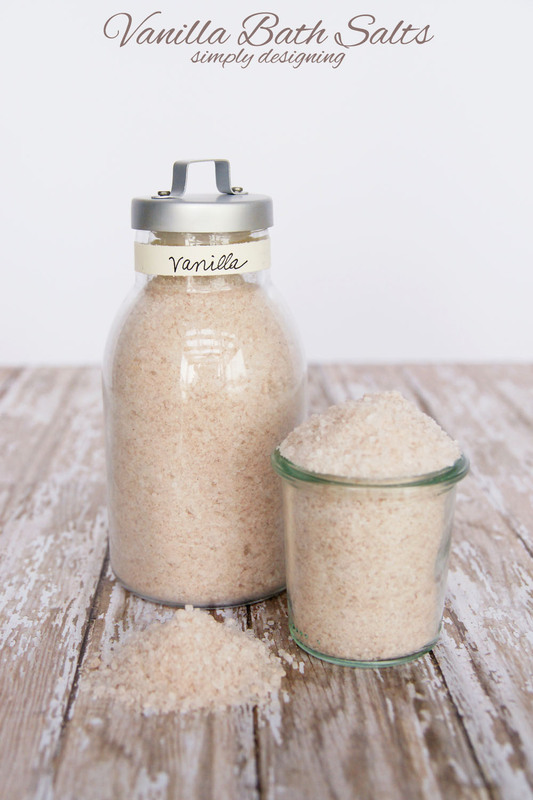 And today I am excited to share my recipe with you for Vanilla Bath Salts! Place salt and soda into a dish and stir well. Add fragrance oil until it is strong enough to suit your preference. Add brown colored powder food coloring if desired. Why did I choose these ingredients for my bath salt recipe? Soaking in a bath with Epsom salts can help relax your muscles, reduce swelling and draw out toxins. Baking soda helps sooth your skin. Vanilla is a very calming scent and is one of my favorites so that is why I included it! 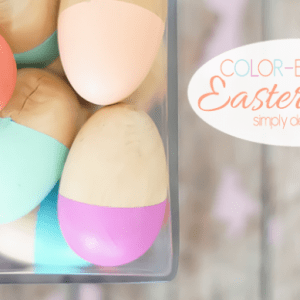 And the food coloring is totally optional! You don’t use enough to worry about coloring your skin while in the bathtub, but it does give the bath salts a pretty brown hue to them. Hi Colleen,<br /><br />I ordered powdered food coloring online…it was almost a year ago though, so I don&#39;t remember where. Sorry!<br /><br />And that is great advice about epsom salts! Thanks for sharing. Powdered food colouring should be available in specialty cake shops where they sell the where with all to make cakes. Or perhaps even a specialty kitchen warehouse store where they sell all the cake pans, utensils and such. Since you are not ingesting these bath salts I doubt there is an issue.. A hot bath is a hot bath… And that is something that is not for all. did you use pure vanilla essential oil or diluted? I used a fragrance oil, but you can use a pure essential oil or diluted. It is up to you. I can&#39;t get epsom salt in my country, is there a substitute or a way to make the salts with the same use without it? Thanks! Yes!! You can! Sea Salt is an option and sometimes you can actually find something called Bath Salts. You want a salt that will dissolve in the water. Good luck! Can you just use table salt? can you use vanilla extract for the scent? What about using cinnamon in place of the brown food coloring? I would assume it would add (even if just a little bit) to the fragrance, and I have heard that it warms and relaxes muscles when used in massage oil. People with sensitive skin should be cautious with it, though. Thoughts? I am definitely not an expert in this area, but cinnamon would give a brown color to the salts. I would just be careful since cinnamon can be a bit strong for sensitive skin (like you mentioned) and around eyes too 🙂 It would smell amazing though!!!! How much of the oil did you use? 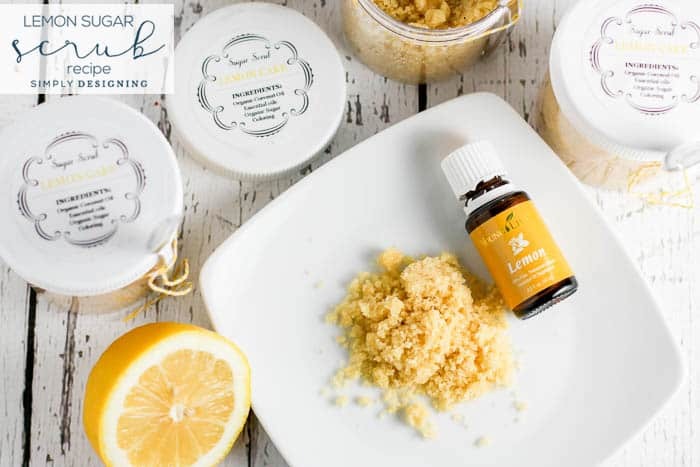 I”m considering doing an orange ginger scent as a knockoff of the Bath & Body Works aromatherapy line and I don’t want to over-do the scent! Great question Larissa! The amount of fragrance oil you use will depend on how much salt you use and also the fragrance. What would be a cute container be? 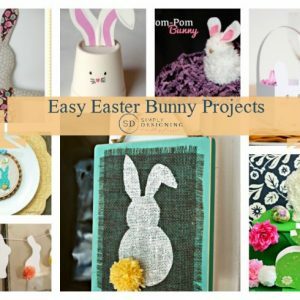 Just made a few of these for gifts but realized I don’t know how much to tell them to add to the bath? I’ve seen on other sites people suggesting 1/4cup up to as much as 2 cups (per the epsom salt directions on their bag). What would you suggest? Thanks! That’s a great question Liv. And in all honesty it would depend on the size of the bath tub being filled. But I would definitely recommend using the amount the epsom salt bag suggests. 🙂 I generally use about 1 cup or so. Just looking through your amazing recipes and the vanilla bath salts recipe sounds great. Add salts to warm bath water after the tub has filled and make sure they’re dissolved before relaxing in the bath for 10-20 minutes. I have high blood pressure and pre-diabetes – and take an epsom bath soak every single day. I asked my doctor about it and he said the only time it is a problem is when the diabetes is so bad that the nerves in the feet are damaged – that’s bad diabetes that has gone unchecked and unregulated. So he told me to soak away and enjoy the benefits. Though this is an older post, thought I’d share what I learned after I asked. 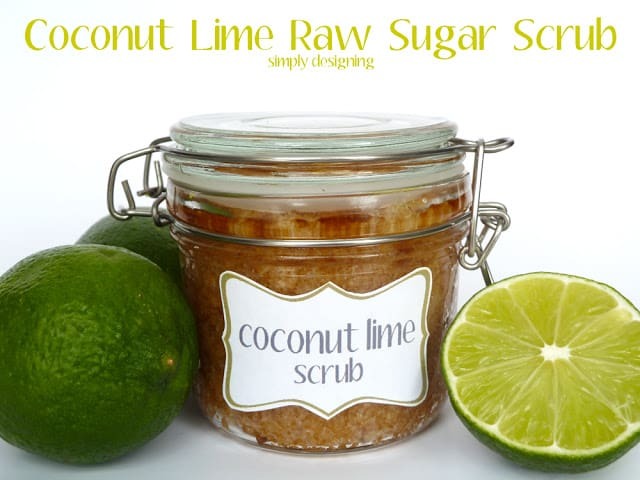 How long çan these products last especially the citrus scrub? Do these need to be kept in the fridge so they do not go rancid? How do you dry the bath salts out as mine are always damp in the jar aren’t they supposed to be dry ? Just went to bath and body, they have a vanilla/ patchouli bath salt for 16.50 (yikes!). It was awesome!! I want to mimic that!!! I have ordered the vanilla oil and cannot wait to try it!!! I have personally never even heard of this until you mentioned it. In looking online it seems to be a problem primarily with citrus oils and baking soda, but I haven’t had any issues with anything so far. I think in order to help prevent any issues you could package these in a cello bag so that air can get in and out if needed.